and their RH groups on their outings. these RHS groups at one of their luncheons. Check out our "Events" page for further details! will be posted above our events. Just click on their "flyer" links. RH Group: "The Twilite Gals"
Most of you already know Pat S as she is also a member of our group. Along with being the queen of "The Twilite Gals" she is a fabulous crocheter, and what some of you don't know is she is also a fisher-women. That is what her royal name says, cro=crochet & fish=fisherman. Pat's group does a lot of local activities and her ladies are friendly and join us in some of our events too! 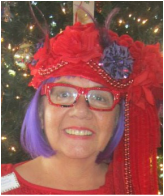 She is the queen of the "Vintage Babes" in fountain Valley. We originally met at the 2011 "Mall Hoot" and she invited us to meet her and her group for lunch. 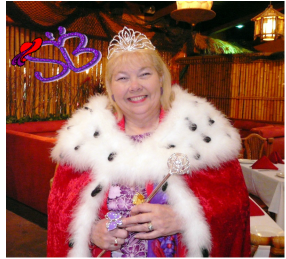 Vice Queen Pam and Queen Mum joined her group in March 2012, at Mimi's Cafe in Fountain Valley for her monthly lunch. She is a very friendly and warm gal and I encourage you all to join her and her group, when you get a chance, at one of her monthly lunches. She also has fun joining in activities with 3 other groups: Ruby Rail Cruisers, Sea Bonnets, and Rock n' Dynamos. RH Group: "Purple, Red & Ravishing"
Queen Diana is the queen of the Long beach group, "Purple, Red & Ravishing." Vice Queen Pam and Queen Mum met Queen Diana[who is also a Red Hat Ambassador] at the 2011,at her annual "Mall Hoot", Queen Diana is a lovely lady with a very fun group. She hosts monthly breakfasts at different Long Beach restaurants on the 1st Monday of each month, which we have been invited to join her group. She is a very friendly and talented gal and I encourage you all to join her and her group when you get a chance. 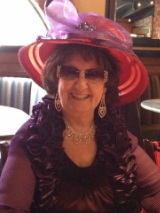 RH Group: "Ruby Rail Cruisers"
Vice Queen Pam and Queen Mum met Queen Cathy at lunch with the Vintage Babes. Queen Cathy had extended an invite to all our members to join her group in any of her activities. She has a very active schedule and does a lot of interesting "rail" trips. She also has a monthly lunch or dinner which includes after dinner games; playing "Mexican Train" or "Chicken Foot" domino's. She is a very friendly and talented gal and I encourage you all to join her and her group when you get a chance. I will be posting events from her group along with other groups; Sea Bonnets of Westminister, "Rock'n Dynamos" of that Queen Cathy and Queen Gwen have introduced to Vice Queen Pam and Queen Mum on our "Events" page. Do check it out! The schedule for her group's "Mexican Train" domino's events are posted on the "Events" schedule page. Queen Jenny and Queen Mum met at the Meet & Greet we had in Feb. She is a very creative and friendly queen. Her group is local, Lakewood/Long Beach. She has a lot of crafty events and hoots she shares with her group. They have been together for 5 years. She has some fun events planned and some of our members enjoyed going to her "Empty Pockets" in April. I met Queen Helen through Q Gwen. She is a lovely lady, married and has 3 children, 9 grandchildren, and 15 g-g-children. She enjoys helping out with volunteer work and started a program for underprivileged children at trailer parks. She joined us at Charming Charlies for a fun RH day. looking forward to many more joint events with her group. Vice Queen Pam and Queen Mum met Queen Jeanne and her group at their annual picnic we attended in August 2011. She has a fun and friendly group and her picnic was great. We also sat with her and her member Valerie at the RH Birthday Bash at the Hard Rock in April 2012. Queen Mum met Queen Alyce at a Royal Tea in 2012. She invited SB to join her group at any of their events. QM went to their "Ho-Down" in 2014 and sat and talked to Q Alyce in length. She has a fun and friendly group and she is very active. We look forward to spending more time together with Q Alyce and the Rosy Riveters. 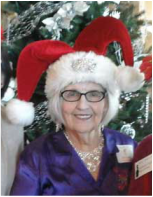 Queen Mum met Queen Maria at the SB Christmas Party in 2014. We had been conversing online for awhile. I invited her and her group to join us at any of our events. She is active with RH and lives in the Walnut area.